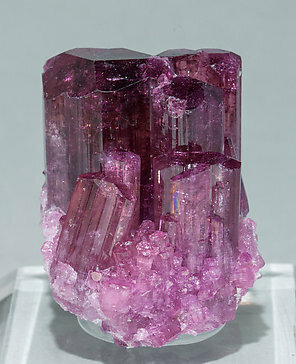 Very well defined Elbaite (Rubellite) crystal, not thick, with good uniform color, transparency and luster. The crystal grew implanted on a doubly terminated curious crystal of Quartz. 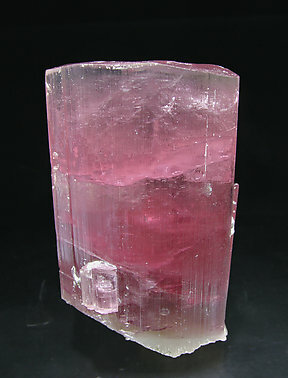 The upper termination of the Elbaite crystal is recrystallized and the termination below is broken. Magnificent color. Crystal is multiple prism but terminal faces, being complex, are less definite and bright. 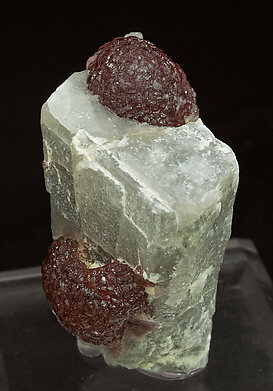 Note the esthetic position on the matrix of Mica and Quartz. Among the best samples from this locality. 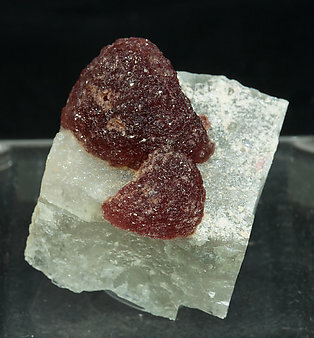 Two single Elbaite (rubellite variety) crystals, one of them doubly terminated and hemihedral. 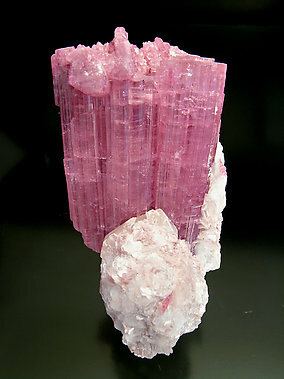 The crystals are with Albite and tabular Muscovite crystals and are translucent with an intense reddish-pink color with stripes of slightly yellowish shades. Group of curious aspect because it is formed by very short prisms in which the triangular terminal form is dominant. Its color is very intense. 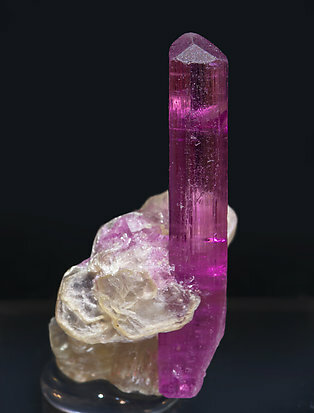 Colorful and sharp classic Elbaite (Rubellite) from the classic Himalaya Mine. 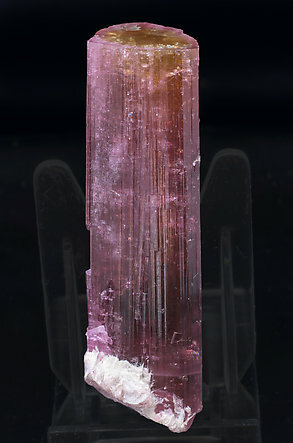 The crystal is thick, transparent and crystallized at the base. The association with a doubly terminated quartz gives it a nice contrast. A perfect and potent specimen! 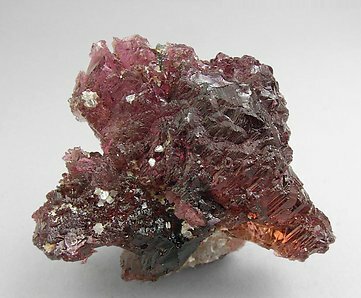 Parallel polycrystalline aggregate with good terminations, an excellent luster, and the particularly intense and deep color of the samples from the Jonas mine, one of the great classic localities for rubellite. 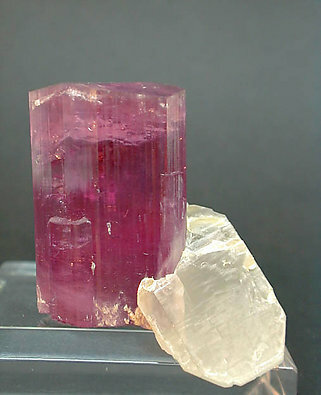 Parallel growth of crystals with very well defined faces and edges, with perfect terminations, translucent, bright and with an exceptionally intense and deep color, red with mauve shades. 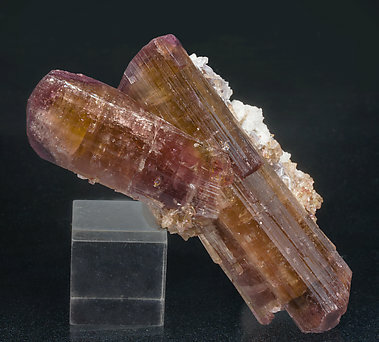 Single crystal with very well defined faces and edges, with a finely striated prism and a terminal pinacoid with small polycrystalline growths. The sample shows an excellent luster and a good transparency, with a clearer geometric color zoning on the terminal area. 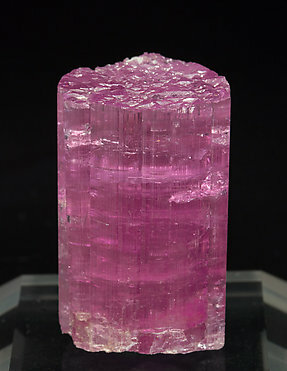 The rest of the prism has a very intense and uniform color, with the tone popularly well known as “pink bubble-gum”. 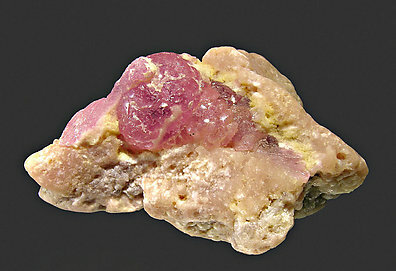 Botryoidal aggregate, very rare for Elbaite, bright, with an intense and uniform pink color, and on matrix. 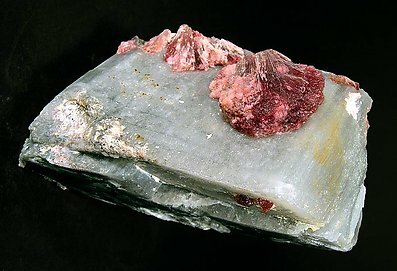 A large prismatic crystal, very gemmy, and with a good mix of especially attractive red tones that show very noticeable zoning. The very sharp rhombohedral faces of the tip show intense brilliance and are especially gemmy. The base is recrystallized. Really esthetic. 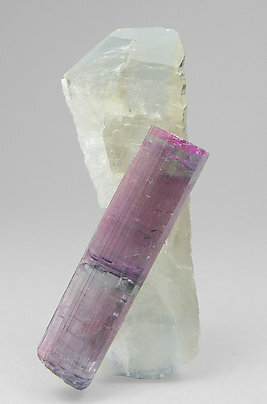 Group of three prismatic crystals, two of them doubly terminated. Definition of faces and edges is excellent as is the luster, but we specially note its color, extraordinarily intense, red with mauve shades and especially deep on the terminations. 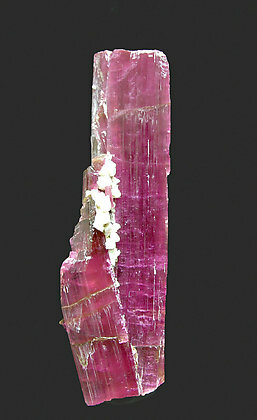 An arborescent Elbaite on Calcite with two colors: pink and deep red. An unusual specimen. 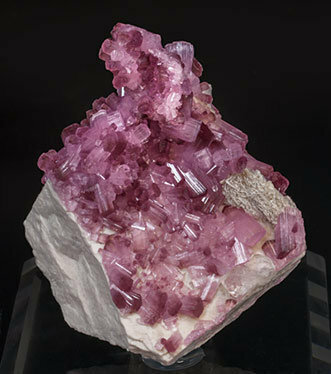 Polycrystalline aggregates (“mushroom” shaped) of Elbaite (rubellite) with very well developed curvatures on the faces and edges that confer this curious appearance to the aggregate. 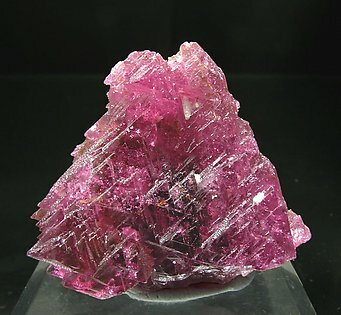 The crystals have three very different shades of color: pale pink on the prism faces, of fibrous aspect, and the terminal faces that present two different red tones. 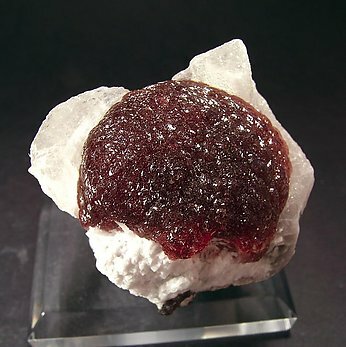 The growth of Elbaite is coating a crystal of Schorl as a hood. Crystals composed of striated prism faces and terminated by a rough and poorly defined pedion face. We specially note its very deep color. 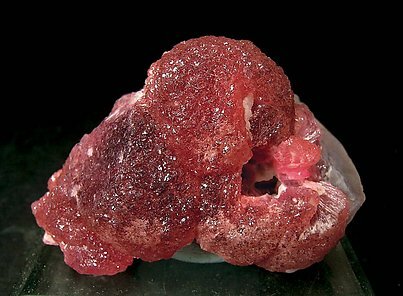 Globular growth, almost botryoidal, uncommon for the species, on Calcite matrix. 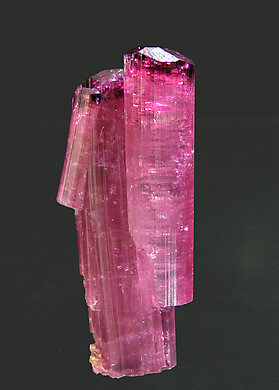 The color, between red and pink, is enhanced by the magnificent luster. 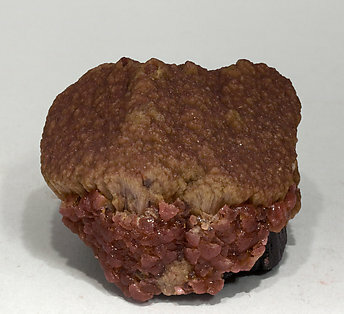 Elbaite polycrystalline growths with a shape well known as “mushroom”, with a very deep and uniform red color and on Calcite matrix. Very appealing with a lively color. One of the spheres of Elbaite is not complete (but it is re-crystallized) while the others are. In my opinion this is the best small sample from the find. The sphere is large and has lots of color and brilliance. 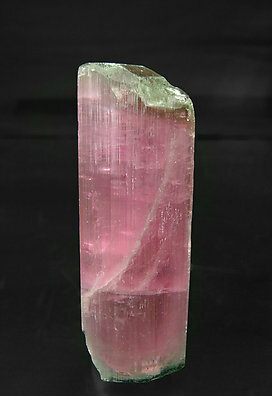 It is also well placed on the matrix of Calcite with some Quartz at the base. To add to that there is a small black Schorl crystal. A great one: this specimen was photographed for the ‘what’s new at St Marie 2004’ section of the magazine ‘Minéraux et Fossiles’ and appears on page 35 of number 331. We will send the purchaser a copy of the magazine. 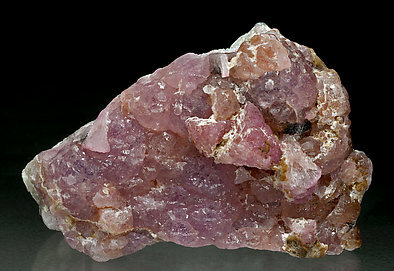 A lovely group of very aerial crystals, many of them partially or completely doubly terminated, translucent and bright with a pale pink color and intense red terminations and on a feldspar matrix. 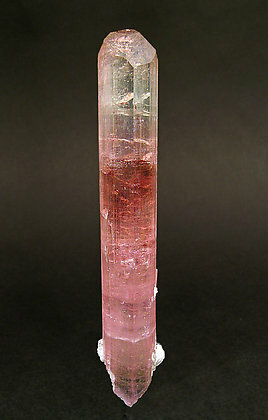 Translucent crystal of excellent color, very uniform, and perfectly terminated with the pedion and the three faces of the rhombohedron. It is implanted on Feldspar matrix, which is not very usual for the locality. A curious and interesting sample not easy to define. A close study reveals a multiple prismatic growth forming a scepter. Color is very deep and luster is very good. 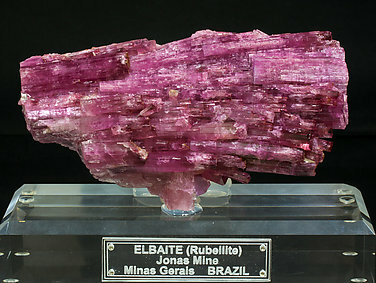 Elbaite (rubellite variety) with simple and very well defined faces and edges and a very smooth pinacoidal termination. It is translucent, bright, has a very intense and uniform color and it is with a tiny Feldspar matrix with leafy Mica aggregates.